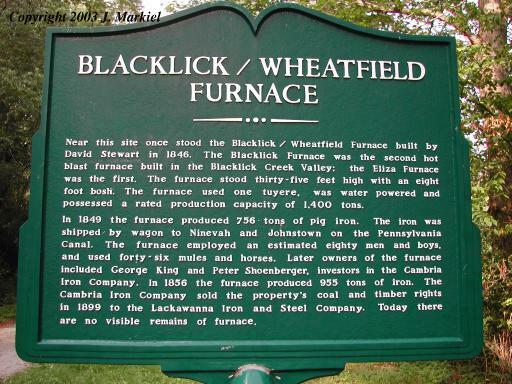 Blacklick Furnace was the second of three furnaces to be constructed in the Blacklick Creek Valley. The other furnaces were Buena Vista Furnace and Eliza Furnace. Unfortunately, the only evidence of this furnace is a historical marker placed along the Rexis Access Trail, located just outside of Vintondale, PA. Located on the edge between Indiana and Cambria Counties. Take Route 22 to PA Rt 403, go north to SR 2012, turn right (east). The road will make a 90 degree turn right, then 90 degree left. As soon as you make the second 90 degree turn, slow down and look for the trail area - is is posted and very obvious. If you cross the creek you have just crossed the trail. The sign is located just north of the road along the creek.